This article is an attempt to give a simple and short account of the Archean terranes of Minnesota, which have been comprehensively described and analyzed for several decades. The first two maps are direct renderings of digital maps from the US Geological Survey and the Minnesota Geological Survey. The elevation map (figures 1-1 and 1-2) were made with the Global Multi-resolution Terrain Elevation Data (GMTED 2010) from the USGS EROS Center. 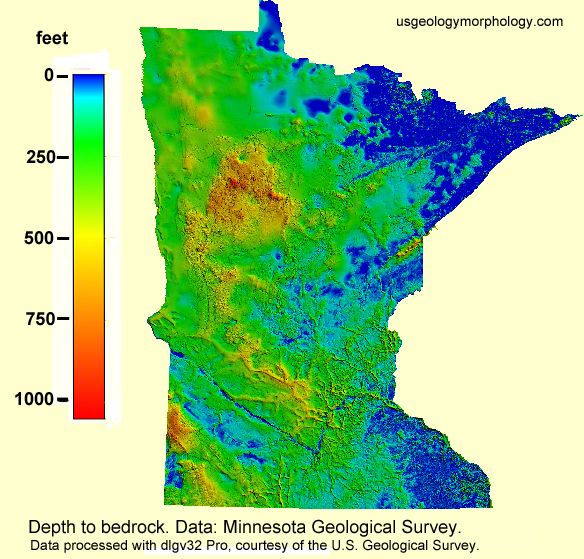 The map showing the depth to bedrock (figure 1-3) was produced with the digital data available with the Minnesota Geological Survey's Open-File Report OFR10_02 (2010). The map of the Archean terranes of Minnesota (figure 3) is an interpretation of the latest geological map of Minnesota, published in 2011 by the MGS, using the USGS shaded relief map as a base map, and showing the main geologic provinces and their major rock associations. The map colors don't necessarily follow the usual conventions of geological maps: the aim was to map the different terranes, not to draw a geological map. Minnesota has some of the oldest rocks of North America and the world, which are the remnants of mountain ranges dating back to the Archean age (3.6 to 2.5 Ga -billion years-; the Earth is thought to be ~4.5 Ga). Only older in North America is the Acasta gneiss of the Slave province, in Northern Canada (~4Ga). These mountains have been completely eroded and Minnesota is today chiefly a flat country. Although its elevation spans from 185 meters (607 ft) on the shore of Lake Superior to 701 m (2301 ft) at Eagle Mountain (in Cook County in the northeastern most part of the state), most of its surface lies between 300 and 500 m (~1000 to ~1600 ft; figure 1-1). The highest elevations are found in regions that were reworked after the Archean, for instance in the Mid-Continent Rift region northeast of Duluth (Mesoproterozoic, ~1Ga) or in the Mesabi Iron Range where the banded iron formations are Paleoproterozoic (<2.5 Ga). Figure 1-1. Elevation map of Minnesota. Highest points: Eagle Mountain (Cook County) in the hills of the Duluth complex; unnamed hill in the Embarrass Mountains (EM), ~3km W of Hinsdale; unnamed hill in the Pike Mountain (PM), ~9km ENE of Virginia; unnamed hill (U) at 47° 13' 56" N, 95° 30' 7" in west-central Minnesota. 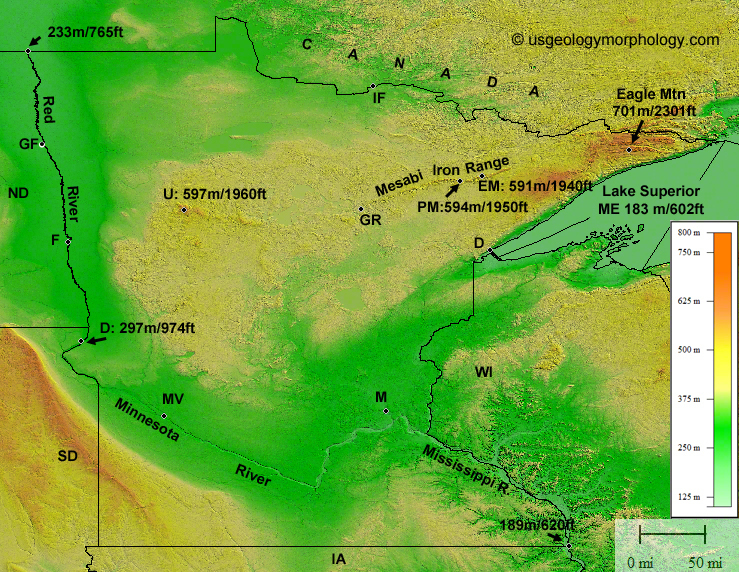 The Embarrass Mountains and the Pike Mountain are parts of the Mesabi Iron Range. Also notable is the divide (D) between the Minnesota River and the Red River basins; it is situated on the Laurentian Divide which separates the areas where surface water goes to the south (Gulf of Mexico) and where it goes to the north (Hudson Bay). Lowest points: shore of Lake Superior (ME-mean elevation); Red River of the North at the Canadian border; Missississippi River at the Iowa border. Cities: D-Duluth; F-Fargo, N.D.; GF-Grand Forks, N.D.; GR-Grand Rapids; IF-International Falls; M-Minneapolis; MV-Montevideo. Data from the USGS (GMTED, US topographic map). 1 ft = 0.3048 m. 1 m = 3.281 ft. Figure 1-2. 3-D Elevation map of Minnesota. See locations on map above. Heights exaggerated 25 times. In the Quaternary, during the glacial ages, the state was overlain with glacial deposits that largely remain in place today. So the bedrock (as opposed to the surficial deposits, of fluvial or glacial origin) is rarely visible at the surface, buried at a depth which can go beyond 1,000 feet (~300 meters) as shown on figure 1-3. 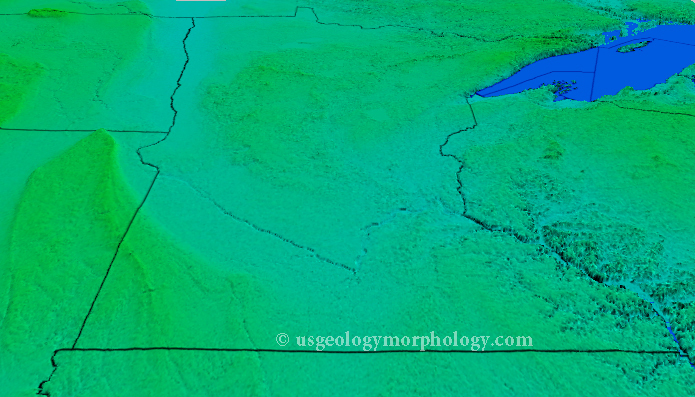 Most outcrops, as the map shows, occur in the northeastern part of the state, where the glacial cover is thinner. The other major location of outcrops of Archean rocks is the Minnesota River Valley, between Montevideo and New Ulm, thanks to the river that cuts through the surficial deposits. Since these outcrops are scarce, much of the knowledge of the bedrocks comes from aeromagnetic and gravity anomaly studies which show how far westward these provinces extend. For example, on earlier maps, the Quetico subprovince was thought to end at the Vermilion Fault (or its prolongation). Now it is assumed it stretches westward to the North Dakota-Minnesota border. The Archean rocks outcrops are in the northeast (Wawa and Quetico subprovinces in the Lake Vermilion region and in the Minnesota River Valley, which explains why most geological studies have been conducted in these areas). Projection is different from figure 1.